November contents: Thoughts on Polytunnel Purpose and 'Style'....My polytunnel years....Getting started with a polytunnel: .choosing....erecting....deciding on layout....improving soil...other Nov. jobs. Despite a hard overnight frost - yesterday it really felt more like spring in the polytunnel when I went out in late morning to pick some lunchtime salad leaves. In the pleasant warmth, bees were humming, foraging on the salvias, and the winter flowering wallflowers were wafting their exotic scent into the air. Birds were singing outside, wrens and robins hopping around inside - rustling around among the scarlet autumn leaves of the peach trees, looking for insects. I enjoy such precious moments here in my Narnia. In an increasingly chaotic and angry world, more than ever, this peaceful place is where I want to be. No matter what problems there are in the world - being out here among Nature, growing plentiful organic food for us, and providing food and habitat for all the wildlife that we now have here in our five acres, I have the satisfaction of knowing that I'm making my own positive small difference by "being the change that I want to see". It's a good feeling. My polytunnel style is what I call 'Polytunnel Potager' - or in other words - how to produce more delicious food than you ever have thought possible in a more beautiful space than you could imagine. A sort of personal 'Grow your own Paradise'! Some may think that 'style' and 'polytunnels do not comfortably belong in the same sentence! I must say I can definitely agree with that when I see some examples of forlorn and neglected looking winter polytunnels! Unlike the beautiful Victorian glasshouses - polytunnels are really rather more practical than decorative structures even if abundantly full of crops. But as I've so often said - if you use a polytunnel well all year round - then you want it to be as nice a place as possible to spend what may be quite a lot of your time. I know from experience that when your eyes are filled with the glorious abundance inside a polytunnel planted in my 'Potager' way - then it's the natural happiness and beauty of all the plants that demands one's attention - not the less than beautiful structure that's protecting them from the elements. The more utilitarian aspects of the polytunnel tend to sink into the background. As you can see from the pictures above taken in different years - my main polytunnel is really a potager or kitchen garden in miniature - but sadly it never looks perfectly organised like a show garden would - with rigidly organised rows of neat vegetables all identical and with bare soil in between rows. Every inch is full of as much colourful, nutrient-packed food as possible all year round, so it can often look a bit of a muddle to some people's eyes, because there are so many different vegetables, fruits and herbs crammed into every possible space! In addition to that - anywhere there is even a tiny space, flowers are planted - many edible - which liven up winter salads and also feed any non-hibernating bees or other vital insects that may venture out on mild days. Believe it or not - there are good reasons for this seemingly and deceptively uncontrolled lack of 'neatness'! One is that despite being essentially an artificial indoor environment - it's still a 'real' garden, which grows real food, for a real family all year round! As crops are harvested, something else is always somewhere in the wings in modules or pots waiting to take it's place. The other reason for what can appear to be a 'muddle' is that Nature doesn't grow things in perfectly neat rows of just one kind of plant - it mixes things up a bit. I like to copy the way Nature grows things as nearly as possible, as I've found that has always given me the best results, with no pests or diseases and with the soil improving every year. Another reason is that different plants have different root structures and their associated microbial communities which all use the soil differently. The late Lawrence Hills, (who started the HDRA -,now re-named Garden Organic and who I was lucky enough to meet and later sculpt a portrait of) once said that the soil is like the gut of the plant. This is something which I have always believed to be true, even before science began to prove this theory to be correct.The latest soil science is now beginning to show that growing plants as varied communities, rather than in single species rows with bare soil in between, is far better for soil and produces much healthier plants. To me though - that's surely only common sense! Just as in every other community in Nature - even our gut - there is health and strength in ecological diversity! The one thing I am fairly strict about though is rotations - as despite what I've heard some gardeners say recently - my 40 plus years of organic gardening experience have taught me that rotations are a vital tool in helping to keep down soil-borne pests and diseases. They also stop the build up, or conversely, gradual depletion of particular nutrients. In practice - a four-course rotation isn't that complicated - it just means that everything moves around the tunnel so that nothing is grown in the same bed more than once in four years. So if I have certain crops which I find work well together, then they move around together every year. It can be harder to ensure this in a polytunnel though - and this is why it's vital to do a detailed cropping plan every year. It's all too easy to forget where you grew something three years ago, when one's growing so many things! This year, just like last year, been a strange autumn weather-wise alternating from boiling hot to freezing and back again for a couple of months! Perhaps this is what we may expect in the future from climate change? Not all lovely and warm all the time which is what some people perhaps hoped - but more erratic, wild swings and even hurricanes like Ophelia a couple of weeks ago! Like all of you I haven't found it easy to easy to cope with growing all our own veg, especially in a vulnerable polytunnel. I've also been very busy with a family member having been unwell and needing a lot of time and care - so some things were planted a bit later than usual and some still remain to be planted. But these days experience has taught me not to panic - because I know that things will catch up as long as they're well fed and watered if they are still in pots, and I'm happy that we'll still have plenty of our most important winter tunnel crops again. I like to have plenty of the healthy seasonal green salads, which we eat endless variations of at lunchtime every day. This is one of the other things I'm very strict about as they are full of fibre and antioxidant polyphenol phytonutrients which are vital to our health all year round. It's such a joy to be distracted from my work, to walk away from the computer and go out to pick some fresh salads for lunch - and to be met at the polytunnels by the dear little robin that seems to hang around there all day waiting for me and my pocketful of hen food! There are few things more rewarding than growing food in a polytunnel at any time of year, but right now it's even more satisfying to see it bursting with good things to eat all winter. Knowing that there will always be something to eat come what may is such a good feeling - and is doubtless something our ancestors felt too - when they knew they had their winter larders well stocked. Unlike us however - they weren't lucky enough to have polytunnels! In summer it's relatively easy - stick pretty much anything into the ground and it will grow - almost in spite of you! At this time of year though - things can be a bit trickier so need a little more care. But any care is more than handsomely repaid by being able to extend the growing season so much at both ends - and by defying the weather outside. I would say polytunnels give you at least another month of growing time at either end of the growing season! And if you get it right - you can pick a huge range of wonderfully healthy fresh salads and many other vegetables such as chards, spinach, more tender kales and calabrese all winter long. At most times of year there's very little choice in shops compared to what you could grow at home or perhaps find in a farmer's market. In winter the choice is even more restricted - with almost never any salads other than sad-looking bagged baby spinach, which is already several days old! Even the organic produce sold in farmers markets can never be as fresh and vitally alive as something you picked just a few minutes ago in your own garden! In a polytunnel. Grown in a polytunnel - hardy vegetable plants grow far better and are so much more productive and juicily tender than they are outside. More than just the occasional higher temperature - it's actually the shelter from the howling cold winds and often torrential rain that autumn and winter can bring that plants really appreciate. After walking through a miserably cold and wet garden on a grey winter's day - it gives my spirits such a lift to open the tunnel doors and survey all of the deliciousness and beauty growing away quietly inside. To me it's like opening a box full of horticultural delights - with a wide choice of different salads and other vegetables and fruit to harvest every day. The great Victorian designer William Morris once famously said "Have nothing in your houses that you do not know to be useful, or believe to be beautiful". Polytunnels are undoubtedly useful! Although admittedly - they're not the most aesthetically pleasing of structures! I try to make my tunnels as beautiful as possible all year round. As an artist, the shapes and colours of plants are important to me - the bonus is that they're all delicious and nutritious too. So many food plants are decorative as well as good to eat, that it's hard to choose what to grow. As an organic gardener, I want to attract as many beneficial insects and bees as I can to deal with any pests and to pollinate crops - so the flowers serve that purpose too. I try to tuck treasures into every corner - mixing flowers and vegetables together and never wasting an inch or leaving soil bare. That is in fact exactly what Nature does too. All plants are much happier growing together in a varied community, this is how they evolved to grow, happily co-existing in a symbiotic, mutually beneficial relationship. Planting this way is better for soil too, as it encourages a broad natural diversity of microbial life - soil bacteria, fungi and beneficial insects. These are a vital part of the healthy and balanced soil ecology you need to make things work in an organic garden and to give you the most nutrients in your crops. It helps you to achieve an whole ecosystem that's as natural as possible - in an unnatural space - and it works pretty well, given that our intervention by growing crops together from all parts of the world is a bit unnatural in the first place!. Before anyone says "Well it's alright for you - you can afford a big tunnel - I can't!" - which someone said to me once - I want to tell you something. I originally started of in a very small garden in the mid 1970's, and after a couple of years as a beginner gardener, just learning to grow my own food, I put up a tiny, cheap 6 x 8ft polythene greenhouse as they were called then. I think 'Garden Relax' was the make, if I remember correctly. It was such bliss - I could actually walk into it!! But before I even had one of those I had already made myself a tall polythene cold frame from skip-reclaimed 2 x 1 inch rough timber & polythene, which was about 8 x 6 x 4ft high. This was placed against a south-facing wall, the side against the wall being open and uncovered, so that when pulled away slightly and raised on bricks - it had good ventilation but also provided a lot of warmth and good shelter. I grew my best aubergines ever in that frame against a south-facing wall! So please - no 'I can'ts!' from anyone - it's not a phrase I've ever allowed myself to use! My motto is - 'if I can't do it that way - then maybe there's an alternative'! When we moved to where we live now and I began growing organic veg commercially in the early 1980's I bought my first 13ft x 65ft polytunnel. It was relatively cheap as it had a very light frame. Something I would regret years later when it disappeared over the horizon in Hurricane Charlie! As I went along - I made sure that every single one of my tunnels paid for itself as my gardening life progressed and expanded. Eventually, I ended up with three 13 x 65 ft tunnels and a much stronger, much higher one which was 18 x 55 ft - and by that time I was growing commercially in a serious way, supplying the Dublin Food Coop, establishing Dublin's first organic box scheme and also growing for supermarkets. The bigger polytunnel was a real luxury with far better air circulation and far more head space which allowed me to grow taller crops like French beans and tomatoes - and even grapevines! Each tunnel was only bought when I had made enough money from my growing activities to fund the next one - both by selling my organic produce commercially and of course saving a lot on the household budget by feeding the family. It was hard work but very worthwhile. Of course growing so many crops and having a lot of livestock back then - sheep, hens for laying, chickens for meat, ducks etc. naturally also meant no holidays! So that saved money and helped a bit too. Anyway, sitting on a beach doing nothing in summer sun was never my thing! A couple of days snatched down in Cork, at the ever-wonderful Ballymaloe was all we could manage for our annual holidays when the children were small. The wonderful classic French cooking of Ballymaloe founder Myrtle Allen was a such a treat for me. Local, fresh and much of it organic - it was pure 'foodie heaven'. I'd grown up eating the very best of food as we had a large kitchen garden and orchards and my parents were great food lovers who enjoyed eating out from time to time at well-known restaurants. Good plain cooking is how I would describe my own efforts! I had naturally always been interested in the health benefits of food though as I had a severely allergic child who could only eat organic - and as a child I was eating wholefoods like muesli long before anyone else had ever heard of it! Ballymaloe is actually the only hotel I have ever seen that has properly made Bircher muesli on the breakfast menu. In addition - I save money by not updating to the latest expensive technology every five minutes, have the cheapest and most ancient phone ever, I use everything until it wears out, rarely buy new clothes or make up and rarely need to go shopping at all! Boring? No, not at all - we eat the best food in the world here & enjoy nature! But back to the point! Ten years ago - I had already been retired from commercial growing for some time due to back problems, and also because I wanted to concentrate more on my sculpture. After 20 years, my old tunnels had been re-covered several times, were now in tatters and the lighter-framed cheaper ones weren't worth covering again. They were also increasingly shaded by the shelter belt I was forced to plant in the late '80s to protect the garden from the neighbouring farmer's spray drift! Having learned quite a lot about growing in polytunnels over the intervening years, I decided to put up two new ones, with much stronger frames, in a better location than the others - in order to be able to continue growing all our own food for as long as I can. I also wanted raised beds in them which I already had outside, because I've had progressive degenerative back problems since a horse-riding accident which necessitated spinal surgery many years ago. Having the raised beds means that no matter how bad I'm feeling, I can still garden - and it's such a positive thing to do. I can also sit out in the tunnel for a little while every day in winter - getting my much needed daily dose of light and looking at a very satisfying range of crops! Back to the future - and a salutary soil lesson. There IS life after starting on a building site! 10 years on. A bit of a difference! I now have a humus-rich soil full of active, healthy, happy worms! There is hope after builders! This is the 'soil' I started off with 10 years ago in my new tunnels!! Summer is normally the best time to put up a tunnel, because the polythene is more flexible when it's warm and can be stretched across the frame better. Unfortunately for us though - we chose a bad time to put them up - but 10 years ago the Celtic Tiger was just about still roaring! The polytunnel suppliers were very busy then. They insisted on coming to put them up in the worst weather possible - during the wettest July days on record! Something like 7 inches of rain fell here in 4 hours, rivers were bursting their banks everywhere and many people's homes were flooded. They also insisted on re-spreading all the lovely topsoil I had carefully piled on one side - saying they couldn't get their levels right otherwise - which was frankly complete rubbish - but they threatened to go home unless I allowed them to do just that! Well, to cut a very long story short - they got the tunnels up anyway. My lovely topsoil has been all mixed with awful sub-soil and it was like sticky glue! I left it all to dry out which literally took months while I just grew a few things in containers in there! The following New Year I tried to get a spade into the dried out soil and I broke the spade! I just sat down cried! Not something I'm normally given to - but I'd not long before that dislocated my shoulder! So I then called a builder friend and asked if he could help. He brought along his mini-digger, thinking he'd have all the soil turned over in about 10 minutes. The surface had set just like concrete! Two hours of the digger rearing-up later - he'd managed to break the surface but it was still in huge concrete clods, most about a foot across! More tears! I called another friend to ask if he knew anyone with a big rotovator - not something I would normally approve of as a mostly no-dig or what I prefer to call 'minimum-dig' gardener. But but faced with what amounted to a derelict looking building site - I had absolutely no choice! The friend kindly borrowed a commercial one, arrived with it on a trailer and spent all day going up and down inside the tunnel until most of it was as broken up as he could get it - given that the machine was bouncing off the concrete clods very scarily and threatening to go through the side of the tunnel! After that - the soil was still so bad that I had to loosen the hard pan underneath with a long fork, excavate pockets where I could, fill them with compost and plant things in them as if they were in pots! But it's amazing what plants can do! That was almost 9 years ago. Now, after much compost, constant mulching and green manuring - with worms and nature having time to do their work - the soil is utterly transformed and wonderful. It's full of life, full of worms and getting better every year. You can see the transformation above.The crops speak volumes about the health of the soil. So don't despair if the same happens to you. An abused soil is never beyond remediation - it can always be retrieved with hope, time & compost! I can never express my gratitude enough to those two good friends whose hard work initially enabled the magic to happen! Even if I'd bought in topsoil and just sat it on top in raised beds - crops would never have been as good without loosening the hard pan underneath really well first so that the vital fungal threads supplying nutrients to plants could spread widely and plants could draw up valuable minerals from low down in the soil profile. Fionnuala and Richard had already been here before several times to do various articles over the years - though sadly not all are retrievable from the Irish Times archive - so it's nice to be able to link to this one. It's always great to swap stories with such knowledgeable and observant gardeners - but also slightly scary too - as you know they'll spot any messy bits!! Being very nice people though and gardeners themselves - of course they pretend not to notice! All gardens have messy bits - and mine is definitely no exception! It also produces some delicious food though, as you can see from the photo below which I took on the day. As most gardeners do of course - I wished they'd been here a week or so later! Gardeners are never happy! Pictured in the basket from the left clockwise - Lettuce Jack Ice, leaves of home-bred hybrid kale, ruby chard, purple and green pak choi, oakleaf lettuce Navarra, Oriental radish Pink Dragon, endive White Curled, courgette Atena, with claytonia in centre. On table - sweet potato Evangeline, strawberries Gento and Albion, cape gooseberries and 3 different varieties of figs - looking rather sad as it was a foul day with torrential rain and we were dashing between tunnels! - Of course I naturally found far better ones after they were gone!! What was that about gardeners? Getting started with a polytunnel? If you're thinking about getting your first polytunnel and you're also an absolute beginner gardener, I would advise perhaps putting up something quite small and cheap to start - so that you can learn to grow things on a small scale first and also make your mistakes small scale too. Taking on too much initially is often the main reason why most people give up, because they find they simply can't cope, particularly with the speed that things happen in a polytunnel. In a tunnel everything grows at least twice as fast - and that also applies to weeds!! 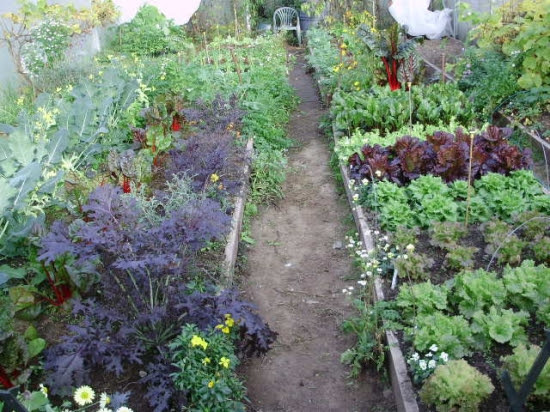 The great thing is that you don't need a huge tunnel or greenhouse to grow things - you can even grow quite a useful amount of salads in a couple of containers in a small lean-to structure or cold frame, as I did, or even a well-lit porch. If you're a beginner at organic gardening - this is often the easiest way to learn how to grow things. Smaller mistakes are cheaper! One thing you rarely have much of a problem with in containers is slugs - and that makes things a lot easier for a start! I've done lots of experiments over the years on growing in containers. Many years ago, before we moved here, I grew an entire vegetable garden in a crazy selection of them as we had to be ready to move at a moment's notice! It doesn't matter what they are - as long as they have enough room for the roots, and have drainage holes in the bottom, something will be more than happy to grow in them! What I call my "law of handbags" definitely applies to polytunnels!! Meaning that like handbags and also freezers, the bigger a polytunnel is - the more you want to put in them! Speaking from experience - no matter how big they are they're never big enough for all the things you will want to grow when you really get going! Bigger tunnels are higher too - which gives you more headroom for tall crops, much better air circulation and more space to grow things like tender fruit trees and vines. I grow peaches at the north end of mine, where they don't shade anything, they take up very little space, and I get an average of roughly 200 large peaches from both of the trees every year. Those would probably cost you a minimum of 1 euro each, if you could buy them, and you'll never get anything that tastes like they do! In contrast - you'd be lucky to get any peaches outside in Ireland as our climate is too wet, which causes peach leaf curl disease - the main problem in peaches. We have abundant container-grown figs from May until October too - outside you'd be lucky to get a crop in September most years. I grow grapes along the sides of both of the tunnels, with the long branches or rods, as they're called, trained at a height of about 1 metre, so that they don't shade anything. Now I get such huge crops of green seedless grapes that I make my own sultanas in my dehydrator. Their intense flavour is indescribable! I've been strongly of the opinion for many years that a small polytunnel should be available free on prescription to everyone - but I can dream on can't I? The vast improvements in people's diet and health would pay for them very quickly, as it would certainly encourage more people to eat their daily quota of fruit and veg. There's nothing quite like picking your own super fresh organic produce - it tastes totally different! It's been a strange autumn weather-wise here this year - alternating from boiling hot to freezing cold and back again for the last couple of months! I've also been very busy with a family member having been unwell following an accident and needing a lot of time and care - so some things were planted a bit later than usual and some still remain to be planted - but nevertheless I'm happy that we'll have plenty of our most important winter tunnel crops again - especially plenty of the healthy seasonal green salads which we eat endless variations of at lunchtime every day. This is one of the other things I'm very strict about as they are full of fibre and antioxidant phytonutrients which are vital to our health all year round. The most fantastic aspect of polytunnels for me is that I can work whatever the weather - so they make food growing a lot easier to fit into an often frantic lifestyle! So, have I persuaded you yet? If so - then here's a few points to consider if you think that a polytunnel is a good idea. Just what occurs to me right now from experience - not an exhaustive list. Before you even start looking at makes, types etc. and invest hard-earned cash - first investigate if you need any local planning permissions etc. Just a couple of things that occur to me - and that are often not mentioned in books. Buy the biggest tunnel you can possibly afford - as I've already said it will pay for itself very quickly if you use it well. Also get it covered in the heaviest polythene you can - it will last years longer. The 'grip-strips' along the base that clamp the polythene on are far better than having to dig up the outside every time it needs re-covering, so they're a good long-term investment. Again they're not cheap - but they're so much easier and a real time and labour-saver. Speaking from experience - it's amazing how hard it is to find help that is of any use when digging up and re-covering a tunnel of the 'buried polythene' type! If it's not done properly and it's left loose - polythene can easily work loose and then all rip to shreds. I feel that cost-wise it's often roundabouts and swings - and that seeming to save money one way can often turn out even more expensive another- especially when a tunnel is full of valuable winter crops! Choose a reasonably level site, sloping just gently to the south if you can. This is ideal for air circulation, as the hotter air tends to rise and frost can slip out downhill on very cold nights if the lower door is open. You need reasonable sheltered from the prevailing winds or strong wind from any direction - but not too over-hung by trees either - which could stop light, or even worse branches could break off and puncture your tunnel! Good ventilation is absolutely essential so it's vital to have a door at either end however small your tunnel is - ideally a sliding door as the ventilation can be varied far more easily according to the weather conditions. They're expensive though - often as expensive as a very small tunnel - but worth every cent on my very windy site! The hinge opening doors are fine but have to be fixed wide-open all the time. As we live on a very windy hill with wind often gusting from different directions on the same of subsequent days - this isn't always ideal. We can get vicious side winds that can threaten the structure of the polytunnel - meaning that doors may have to be closed altogether - which is not ideal for ventilation. Roll up doors are a nightmare! That's how I lost my very first tunnel in Hurricane Charley! they can catch in the wind, double back inside and go up through the roof - which is what happened to mine. The tunnel's a total gonner then and very often the frame too! I would always advise getting the suppliers to erect the tunnel for you themselves and to guarantee their work despite my bad experience! It can often be easier to get a good deal from the makers for them to erect it during the winter when business is generally quieter for them. Don't expect to get a good deal in March or April when everyone suddenly gets keen on grow your own and wants them! It may cost a bit more but it's well worth it as your tunnel will last years longer before it will need re-covering if it's put up properly in the first place. It's false economy to try to do it yourself if you've never done it before. It looks simple - but it's not! Years ago I lost a smaller tunnel that had been badly put up by someone recommended by the supplier - it turned out that he'd actually never done it before despite saying that he had! I lost not just the polythene cover but also the entire tunnel! The frame twisted and distorted so badly that it could not be re-covered again and so was a useless waste of money. So be warned! The larger tunnels also have much stronger frames and if covered with a good heavy gauge polythene and properly erected by the supplier, they will last for many years before they may need covering again. Deciding how to organise your tunnel can be difficult if you haven't had one before, so here's a couple of suggestions you may find useful. Once you've got your tunnel up it's a good idea to rotovate the soil to open it up if it's become compacted during the process of putting it up, as I described above happened to mine. Borrow or hire a rotavator as you'll only need to do this once - after this the worms will do all the hard work for you! You won't want to disturb the soil surface too much by digging once it starts to establish plenty of life in it - as there are fungi which live in the soil and help plant roots to forage further and they don't appreciate too much disturbance! I would advise making permanent raised beds, four or more, so that you can organise the tunnel easily into a simple four course rotation. This keeps the soil healthy, as you will then only grow any plant family like tomatoes say, brassicas, or onions in the same soil only once every four years or more - thus avoiding a build up of pests and diseases. Next skim off the soil where you want your paths, throwing it up onto the beds. Hey presto - instant raised beds! One metre or 3 - 4ft wide beds are easy to work from the paths on either side and as they are raised - that makes the work even easier as you never walk on the soil again. They're bliss if you suffer from back problems! You can put in boards along the sides to edge the beds neatly and keep the soil in, and then things will really start to look organised. The next thing to do is to check the pH to see how much lime there is in the soil. Don't get hung up on testing for deficiencies of this, that, or the other - it's not necessary. You can do more harm than good by adding unnecessary extras. Just do a soil test to get the pH (acidity/alkalinity) right and after that Nature will gradually do the rest itself. You can test for pH very simply with cheap kit which you can get in any garden centre. Generally speaking, a range of 5.5 - 7.5 is ideal, most vegetables and fruit are happy with this, but do bear in mind that it's always a lot easier to raise the pH than to lower it. Then if necessary, apply something gentle like calcified seaweed, or ground Dolomitic limestone, rather than ordinary garden lime. Calcified seaweed raises the pH gently, making the soil less acid. It also supplies minerals and trace elements, and you can use it at any time of year as it doesn't burn roots. Never add ordinary garden lime just as a matter of course each year - doing this can raise the pH far too much and 'lock up' important nutrients in the soil, making them unavailable to plants. If you garden organically using a wide variety of composted plant wastes, green manures and mulches, you will be giving plants a varied buffet to choose from. This will gradually increase the fertility of the soil and build up the microscopic life that plants need to keep them healthy. In the world of plants - one size doesn't fit all. Each plant has it's own specific requirements, and can only take exactly what it needs if it has the right ingredients to choose from, and the right soil pH. They know far better than humans what they need! People can do far more harm than good by adding specific supplements and trace elements, such as boron for example, that some some 'expert' suggested might 'do the trick'! Adding them can seriously unbalance the soil for many years or even be poisonous to soil life as well as plants. If the soil is too acid or too alkaline, or lacking in vital microorganisms, then often these elements aren't easily available to plants. Just get the pH right, add composts etc, and then trust in Nature - it will do the rest! Most people think that the only things that live in soil are worms - but there's a whole world of other microscopic workers in soil just waiting for the right conditions and the right kind of food to encourage them to do the work for you. These vital microorganisms convert plant wastes and animal manures into humus and other foods that plants can use. They are like the probiotics of the soil. Plants need all these good microbes to have a healthy immune system, just as much as humans do. Artificial fertilisers and pesticides like weedkillers damage this soil life. If you use them either in the soil or in seed and potting composts - you will end up with a dead soil and unhealthy plants that are far more susceptible to pests and diseases. Don't be tempted to pile tons of manure onto your tunnel soil which some people may advise either. More is not necessarily better! This is a huge mistake which many first-time growers make. Adding too much nitrogen-rich manure will unbalance soil nutrients and encourage lots of soft unhealthy growth. It will also encourage manure flies, shore flies, and aphids etc. Taking the time to gradually build up a healthy ecosystem in your new polytunnel, with everything in balance, will pay off in the future. If you have time and can get hold of some really well-rotted manure or compost with plenty of worms in it - then you could spread 2-3ins of it on the surface and fork it in or just leave it on the surface and cover with something to stop it drying out - the worms will work it in gradually and do a lot of the work for you. Just cover it with black polythene or something else to block out light and prevent weeds growing - then leave it alone for a few weeks. When you uncover it again to plant things - it will be utterly transformed. The worms will have worked their magic! All you will need to do then is give the surface a light scratch over - or if it's badly compacted fork it lightly - and it will be ready to plant. Slugs can often be a big problem in a new tunnel, so the other advantage of this approach is that you can uncover it from time to time and snip any slugs you'll find on the surface with a long sharp pair of scissors. If you're too squeamish for that - then get a couple of ducks and they'll dispose of them with great alacrity! After a while slugs won't be too much bother if you deal with them regularly. If you want to grow things in the meantime - then put a few containers on top of the black polythene of other cover and grow stuff in those. You may still be able to find a few plants of lettuce, herbs, brassicas etc. in garden centres - and even if it's too late to plant them outside they may still produce a crop inside. Even if it's only leaves they're still edible! Or you could try sowing some of the seeds I suggest in my 'What to Sow' list for this month. Still no time to relax - here's a few suggestions for other November jobs! As I mentioned last month - at this time of year, watering is something I'm always extremely careful about. If I have to do any, I always water the ground between plants - never directly on or around the necks of plants. If you gave the soil a really good soaking before planting your winter veg in the tunnel earlier in the autumn - it shouldn't really need too much watering now. If you think you may need to water it's always a good idea to scratch under the soil with your finger about 3 cm or an inch down to see if it's dry at root level. 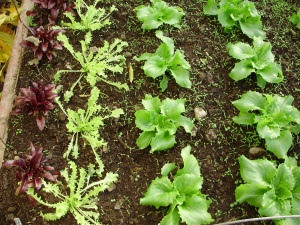 If it feels dry then water, but don't saturate roots of plants now, as lettuces in particular can keel over very quickly with the cold nights and shorter days. I try to water early in the morning on a sunny day if possible, when the top of the soil will have a chance to dry off a bit so that there is as little moisture as possible hanging around in the atmosphere overnight. Winter lettuce is one of the most vulnerable plants - it can go down with botrytis (grey mould) very quickly if it's too damp around the plants. Another winter salad that's coming on nicely now but doesn't mind damp soil is watercress - which I've already picked from several times despite only being planted for just over a month. It grows very fast in a tunnel and needs the shoots picking regularly as doing that keeps it productive and stops it from flowering. It also needs to be kept constantly moist to produce it's lush peppery leaves all winter. It appreciates a bit of fleece draped over it on the very coldest nights, being slightly more tender than landcress. It's worth the TLC though - as I think the flavour is far better than land-cress which has a more 'rocket like' flavour. Watercress will go on cropping well for months as long as you keep watering it and it's higher in healthy phytonutrients than any other green vegetable. There are plenty of other salads coming on now too - lamb's lettuce, claytonia, many different oriental leaves and lettuces, sugar loaf chicory, endives, beet leaves, silver and ruby chards, herbs like giant flat leaf parsley and multi-sown 'Ragged Jack' kale for baby leaves - which will eventually grow on in spring to become full size - producing it's delicious, asparagus-like flower buds in early spring, which are far tastier than sprouting broccoli. Mild autumn weather can encourage chickweed and other weed seedlings - and these are an ideal damp place for those nasty little grey slugs to hide - the ones that get right into lettuce hearts and destroy them! Chickweed tends to hang on to droplets of moisture too - making the atmosphere around salad plants much more damp and potentially causing disease. For this reason it's vital to keep on top of weeds now. Keep hoeing or hand weeding between plants until the leaves fill their space and block out the light between the plants. In another month growth will also slow up a lot more so weeds won't be so much of a problem then. As I've mentioned - I like to be able to pick a mixed salad for lunch every day - even in the coldest weather. I grow mostly loose-leaf types of lettuce and many other types of leaves for picking individually, so that there's always something to pick every day. At the moment the nasturtiums are still looking very bright and cheerful too, releasing a lovely scent as you walk into the tunnel on sunny days. One doesn't notice the scent quite so much in the summer when so many other things are flowering. Non-hibernating bees are very grateful for them too and the leaves and flowers make a welcome contribution to salads, as frost rarely seems to affect them much in the tunnel. It pays to be organised though and keep the fleeces always at the ready to cover things - just in case the weather turns really cold. If you have Christmas potatoes growing in pots these should be covered with a double layer of fleece at nights if even only a light frost is forecast, as they're particularly vulnerable. Early mornings are the ideal time to catch those nasty little grey slugs in the tunnel. They are a particular problem in new tunnels, but after a while they become less troublesome if long as you keep weeds down and don't let everything run wild over the winter as so many people do! Put a few pieces of slate or large stones along beds at intervals and they will hide underneath - then you can just scoop them up. If you have time for a five minute scissor foray - on misty grey days they will even stay on the surface for an hour or so after dawn. So that's a good time to catch them. Even better you don't have to get up so early at this time of year! I try to keep on top of them as they can do an awful lot of damage - particularly to 'hearting' vegetables like Chinese cabbage, Pak Choi or Sugar Loaf chicory if they get right into the hearts. My frogs have disappeared off to their winter quarters now - I haven't seen any for a week or so. All of a sudden I'm seeing just a few more very tiny slugs - encouraged by the damp air and lack of predators. I think it's time to take the fine netting off the doors now too - to let the smaller birds like wrens, robins and dunnocks in. They love to look for insects and small beetles in the tunnel during the winter - it's a valuable source of food for them. I'll leave the large squared pea and bean netting up to keep the pigeons and pheasants out though - and hopefully this year's crop of blackbirds won't try to get in and eat all my worms! They soon learn to fly through the gaps when they can see strawberries inside - but those are almost finished now. The 'Albion' strawberries in large pots are still ripening their very last fruits and they seem less vulnerable to cold than other varieties - they're still tasting really sweet. Only water anything now if absolutely necessary and if the ground seems very dry. Dig around a bit with your finger in the soil if you're not sure. Water well then, preferably in the morning to let the surface of the soil dry out a bit during the day. Over watering, with condensation and damp air hanging around in the tunnel can cause disease. For the same reason, ventilate as much as possible unless it's really too windy. Close the doors well before the sun goes down, or around 3pm at this time of year, in order to retain some warmth. Good housekeeping is essential too - tidiness pays off. Pick off any mildewed, mouldy, yellowing or otherwise dodgy looking leaves immediately - disease can spread like wildfire when plants are growing much more slowly in the damp winter air. Put diseased leaves and other rubbish onto the compost heap or into your worm bin. While there's a bit less to do in the garden - it's a good time to sort out your stock of seed trays and pots. 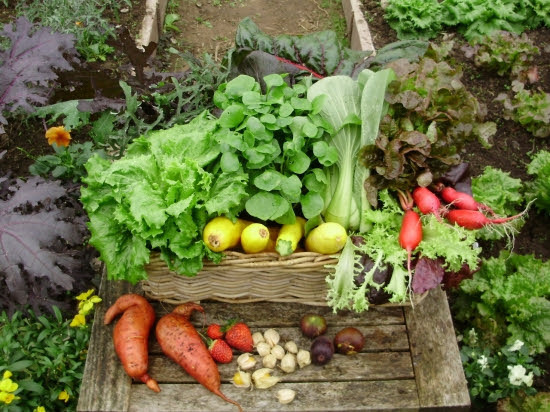 A good money-saving tip - cultivate your local garden designer - offer to barter them some veg. next year for giving you all their old pots. They get through masses and often only throw them away. Recycle them! I have a garden designer friend and we've been bartering pots for years. They last almost forever if you're careful and it's a great way to save money - even half a dozen pots can cost a fortune in garden centres and DIY shops! Particularly the big tree-sized ones! If you don't need that many - then share them with the members of your local gardening club or GIY group. Scrub any pots and trays with hot water that you will need for seed sowing in the spring, and sort into stacks of each size. This will save you a lot of time later in the spring when things really get busy again. Plant a few winter flowers for bees now. Apart from sowing a few early flowering hardy annuals to bring in pollinators and beneficial insects - you could also bring in some early flowering herbaceous perennials in pots - like Hellebores or primulas. They will flower weeks earlier in the tunnel. I've been growing Bowles Mauve perennial wallflower in my tunnels for years, as it's the most reliable 'flowerer' all through the winter. I was delighted to see that a recent survey confirming that bees love my choice! It even flowers most of the winter outside here too. There are often bees around on mild days during the winter - and they are so grateful for any nectar and pollen producing flowers when there's little else around for them. 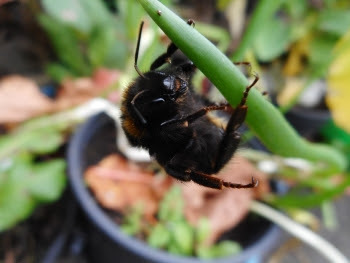 If you're sowing a few broad beans now in the tunnel - (which is the only sensible place in our usually monsoon-like winters) - having other flowers in there in early spring will attract bees in to help pollinate the beans. I'm sowing some of my Crimson Flowered broad bean now, a wonderful variety originally from the HDRA (now Garden Organic) Heritage Seed Library, which I've been saving the seed of for about 35 years. It does well in the tunnel over the winter and is so much more delicious than Aquadulce Claudia - the variety usually recommended for winter sowing. In my opinion that one's so tasteless that it's only fit for feeding to cattle! It's so worth having a polytunnel just to be able to grow winter flowers for creatures like this beautiful bee! The morning following Halloween earlier this week I went out to open the polytunnels and found a bumblebee that hadn't been able to find it's way out again after I closed up the tunnels in the late afternoon. It always makes me so happy knowing that because I've planted all the flowers - then even if that does happen, they won't starve to death and that there's always plenty of food in the tunnel to help them get up and away and back to their nests in the morning! I try to provide everything I can for these incredible creatures - because every single one of them is so very precious .......and they do so much for us in return for us making them welcome! I enjoy sharing my original ideas and experience of growing and cooking my own organic food with you. It's most satisfying and also complimentary that others find "inspiration" in my work. If you do happen to use it or repeat it in any way - I would appreciate very much if you mention that it came from me. Thank you for reading my blog.